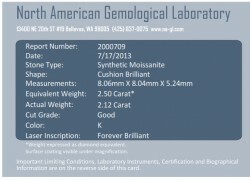 We are offering a limited amount of independently graded Forever Brilliants for those customers who are unable to wait for an Amora enhanced Moissanite. To our knowledge, this is the only program anywhere that offers independent grading report with each Forever Brilliant and ensures you are getting the very best Forever Brilliant rather than 'luck of the draw' as with other dealers. 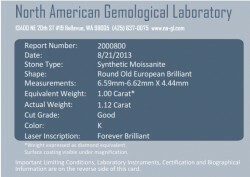 By submitting the Forever Brilliants for independent grading, we reject about 50% of all Forever Brilliants either for lower color (i.e. K vs. J) or cut (Fair vs. Good). 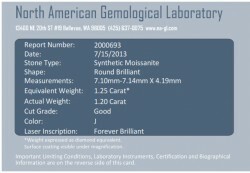 We only offer Good cuts for example and ship every Certified Forever Brilliant with an independent grading report.